Hazelwood and Hill offer the Kimberley Products range including the illume™ skylight alternative. No specialist tools or trade skills are required. You simply mount the solar panel on the roof, cut out the templated hole in the ceiling plaster, connect the cable and you're done. illume™ skylight requires no modification to the roof structure, leaving no opportunity for roof leakage through the light diffuser. Room temperature is not compromised by a roof shaft. 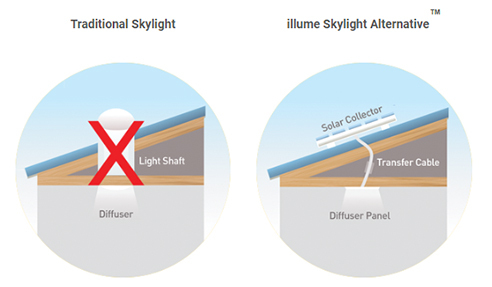 Please visit www.hazelwoodhill.com.au for more information on illume™ solar Skylight diffuser.